Self-Organizing Maps are a method for unsupervised machine learning developed by Kohonen in the 1980’s. They allow reducing the dimensionality of multivariate data to low-dimensional spaces, usually 2 dimensions. Observations are assembled in nodes of similar observations. Then nodes are spread on a 2-dimensional map with similar nodes clustered next to one another. Each node contains information on the number of observations it carries, and on representative values of the different input variables for these observations. These values can be observed in the form of heatmaps, with one heatmap per variable. Observing heatmaps sometimes unveils cluster patterns in the nodes and thus in the observations behind. Comparing heatmaps can give useful information on node clusters characterization. 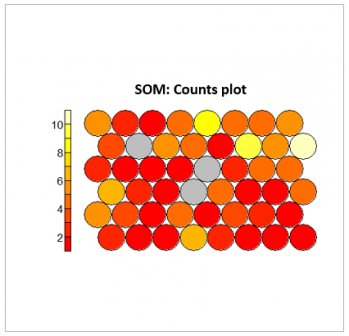 The som function developed in XLSTAT-R calls the som function from the kohonen package in R (Ron Wehrens and Johannes Kruisselbrink).